This is the 100th anniversary of the end of World War One. This blog entry originally appeared ten years ago this day. I thought it appropriate to repeat it. We have corrected some grammar and updated the pictures. On the 11th hour of the 11th day in the 11th month of 1918 the "War to End All Wars" ended. Most of the great names of the English tool industries survived the war but really it marked the beginning of the end. Most of the reasons for the decline were changing tastes, changing technology, and other seismic changes that the war really sped up but didn't directly cause. During the war the British government realized that unless they supported business during the war many of their industries would not survive. Some business simply switched to war production (as Norris did during WW2) but your average tool company like Norris during WW1 didn't have the machinery or the capital to do anything other than what they knew how to do - make tools or in Norris' case make planes. So the British government placed orders for a lot of stuff that may or may not have been actually needed by the army but was certainly needed by the manufacturers to stay in business. Demand of course for fancy infill planes was obviously small, but Norris was issued at least one contract for a bunch of very simple A51's. 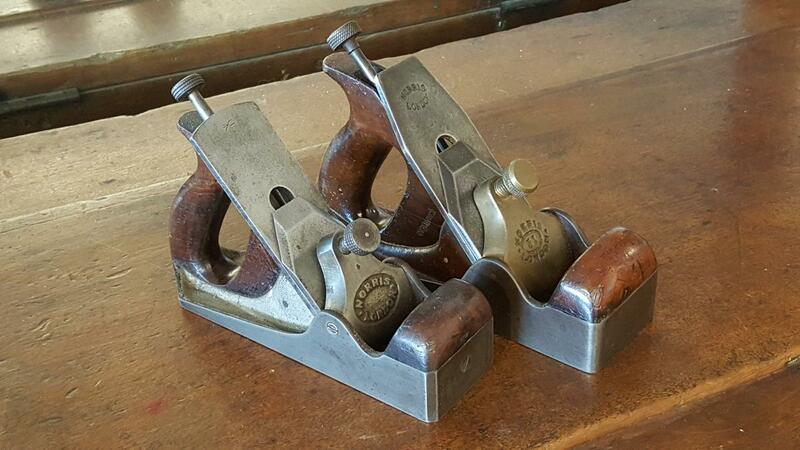 I don't know if the intent was to use the planes and these simple models were the most price competitive to Stanley type planes. There certainly were a lot of military carpenters who would have needed the planes. Or if they were bought, stored, just as a way of subsidizing the company, and after the war sold as surplus. As Norris' go it is very low end model of infill, crudely made compared to peacetime models. It has an iron lever cap and iron screw because brass was in short supply and strictly rationed for cartridges and weapons. The mark that indicates it was purchased by the defense department is the "Broad Arrow" or British acceptance mark, which was stamped on goods to indicate that they were accepted by the military as having passed any quality or standards tests. 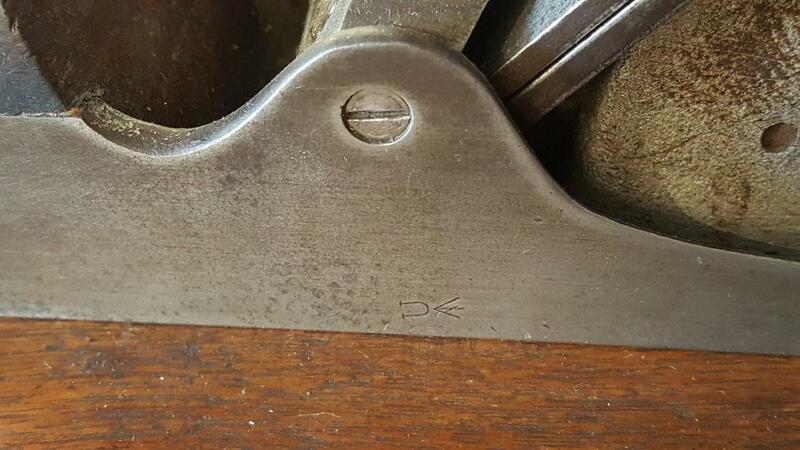 This plane is stamped on the side and also on the 2" wide iron. 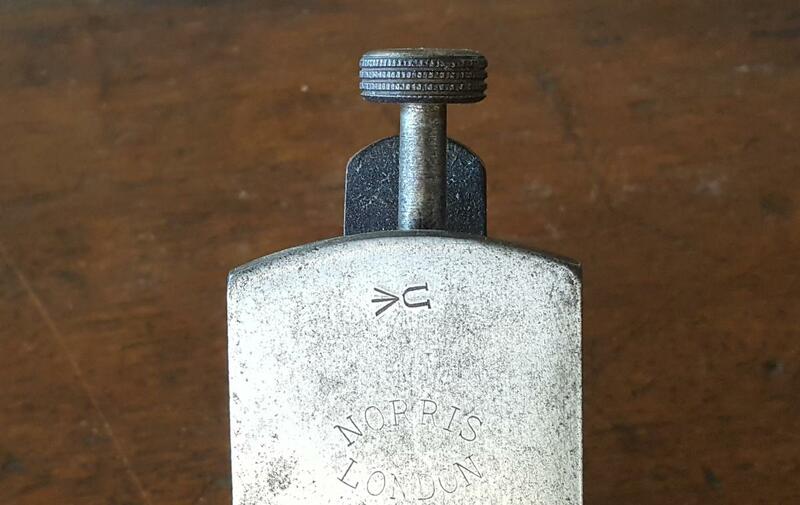 All the parts are original and the iron and cap iron are also stamped with the Norris logo. 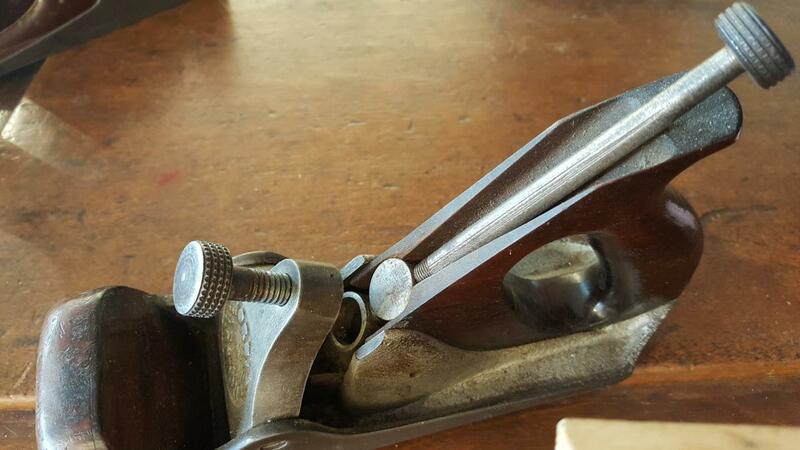 The lever cap doesn't have the usual model number but this plane is basically a narrow no. 51. In the last photograph you can compare the plane to the more common 2 1/4" wide peacetime no. 51. In this case, a fairly early one. To me this plane is more than a simple Norris souvenir. It's a witness to how, in a terrible time, Europe convulsed and war affected everyone and everything. Even the planemakers. The broad arrow signifies “government property” and was also used to mark trees for use as ships masts in the North American colonies. I would love to have one of them! But, the comment that held most sway with me was "Europe convulsed and war affected everyone and everything. Even the plane makers. " Forgive me....not attempting to be a sentimentalist, but I was struck by the difference NOT IN post and pre-war planes, but by the difference of how we now deal with war. For too many of us, it is 3 minutes of television or a commentary somewhere--with no reflection of the costs, loss of life, or, most important, whether the sacrifices made are worth the "objective" of the war. I am uncertain whether our hand tools are really superior (to be honest, I think most of them are improved versions of older ones)........but I have the almost fatalistic feeling that Veteran's Day has become "just another day". It seems to me that we have many leaders (including some in our own country) who, as always, fight wars with the lives of others for nothing more than MORE power-- and, of course, money is always involved, one way or the other--perhaps they are the same. Although there are not a lot of WWII veterans left, probably none from WWI, there are still a lot from other wars or "police actions". Calling just one veteran and stating that you appreciate the sacrifice that individual made for your country could mean a lot to that individual. Perhaps, just let them know that someone is aware of the pain, fear, and turmoil they experienced to make certain we remain "free". I should not turn your dedicated column into a political forum--but, I will make this statement: There are wars worth fighting! There are other wars that are perhaps merely opportunities for profiteering and creating more hate. Those former wars do, in fact, create the seeds for many more wars. Somehow, woodworking and the tools used to create useful objects take our minds away from the horror of a very small minority of people who are always looking for a reason to fight. I have no solution--just the thought--sometimes you walk into the shop to "make something" with no plan--possibly to try a new tool. Not often, right? How many of the wars that exist, today, are the result of idle minds and hands that just want to "start something"--and maybe "try out a new weapon?" Thank you for your comments, efforts, and information. I believe that practicing and supporting the Crafts instinct, with its peaceful, useful and satisfying outcomes is a good way to inhibit and discourage our primal warlike urges. Crafts primarily encourage cooperation and helping rather than competition and destruction of one's "Enemies". Building and Maintaining, rather than Destroying !! "Rambo" and "Trumpian" displays notwithstanding !! The Crafts approach, whether Woodworking, Fly Fishing or others, brings much more happiness than "competing" and "fighting" !! 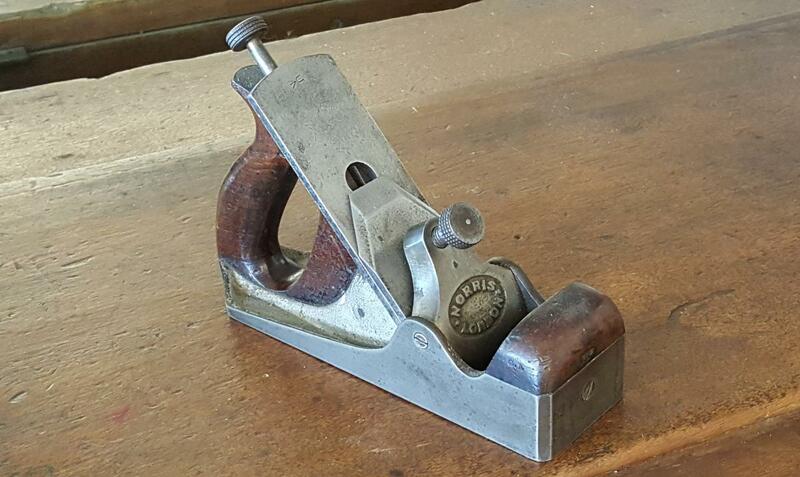 I subscribe to this blog because I love old tools. If I was interested in anyone's commentary, negative or positive, I would go to a political website. Can't we just keep this about tools? I've fought other people's wars and I'm done with that! This reminds me of an Ontario Tools of the Trades sale a few years ago where I looked at a travel sized WWI British Army tools chest. All the planes in it were wood stock (lighter to transport?). Nothing fancy or valuable that I could make out but looking into a full set of war time tools preserved preserved like that was moving.